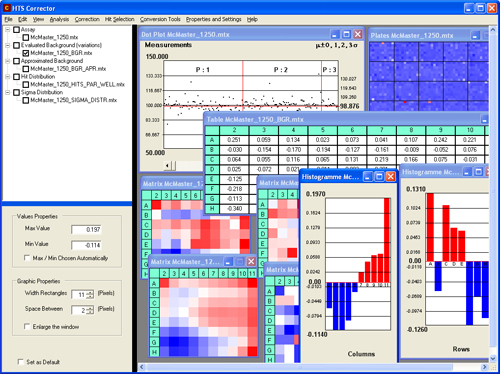 HTS Corrector software is designed to examine and visualize HTS data and correct experimental HTS assays. Kevorkov D. and Makarenkov V. Statistical analysis of systematic errors in high-throughput screening, Journal of Biomolecular Screening, 10: 557-567, 2005. Kevorkov D. and Makarenkov V. Quality control and data correction in high-throughput screening, Proceedings of SFC 2005, pp. 159-163, Montreal, Canada. Makarenkov V., Kevorkov D., Zentilli P., Gagarin A., Malo N. and Nadon R. HTS-Corrector: software for the statistical analysis and correction of experimental high-throughput screening data, Bioinformatics, 2006, 22: 1408 - 1409. Andrei Gagarin, Vladimir Makarenkov, and Pablo Zentilli. Using Clustering Techniques to Improve Hit Selection in High-Throughput Screening, Journal of Biomolecular Screening, 2006 in press. A. Gagarin, D. Kevorkov, V. Makarenkov, and P. Zentilli. Comparison of two methods for detecting and correcting systematic error in high-throughput screening data, Data Science and Classification, V. Batagelj, H.-H. Bock, A. Ferligoj, and A. Ziberna (Eds. ), 2006, Series: Studies in Classification, Data Analysis, and Knowledge Organization, Springer, pp. 241-249. High-throughput screening (HTS) is an early-stage process in drug discovery which allows thousands of chemical compounds to be tested in a single study. The aim of our work was to develop and implement methods for minimizing the impact of systematic error in the analysis of HTS data. HTS-Corrector is a software application for the analysis of HTS data, detection and visualization of systematic error, corresponding correction of HTS signals, and hit selection. New methods for the statistical analysis and correction of raw HTS data are included in HTS-Corrector: background evaluation, well correction and hit selection using clustering procedures.